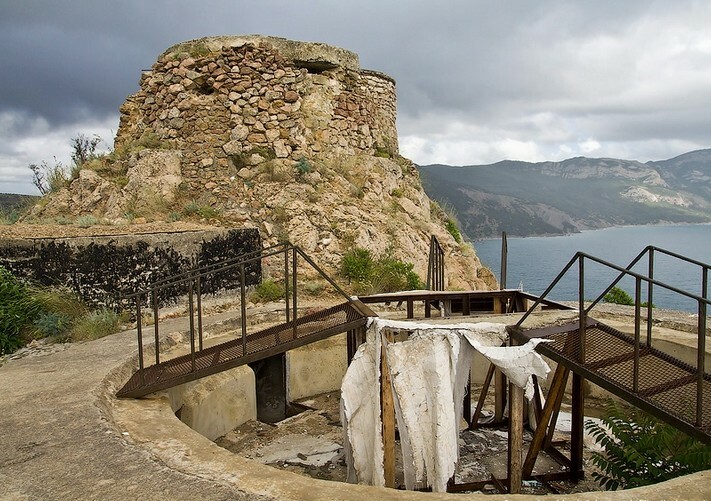 Almost a hundred years ago, a 4-gun battery was built by the decision of the Military Russian Council on the western shore of the Balaklava bay in order to protect Sevastopol. 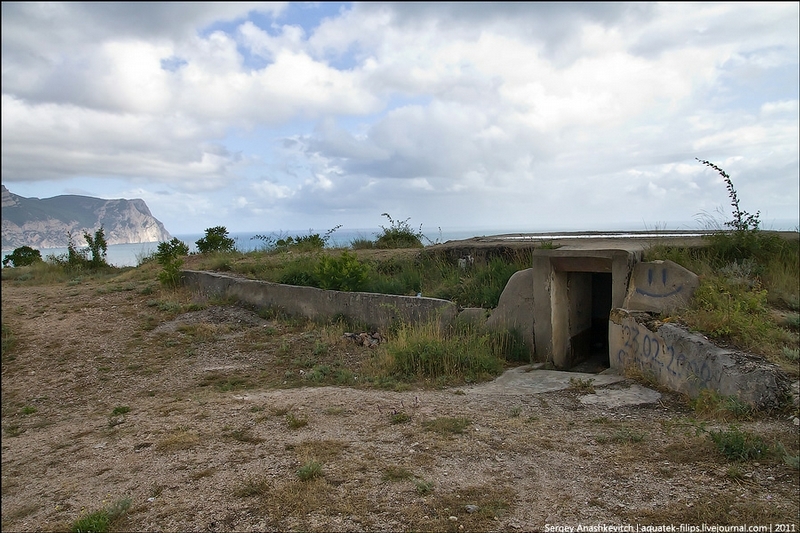 This was the most southern outpost of the defensive line that was able to get cruisers and battleships at the distance of 20 kilometers. 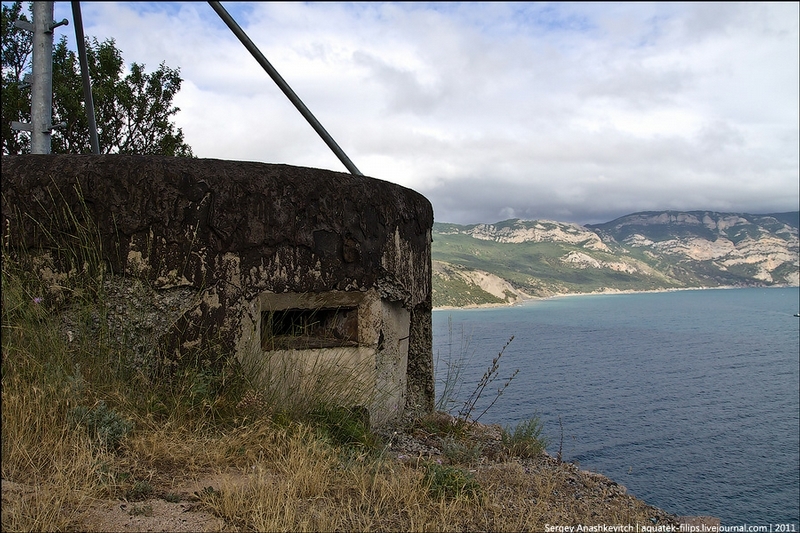 However, the battery did not actually perform its primary task to fight the enemy at sea. 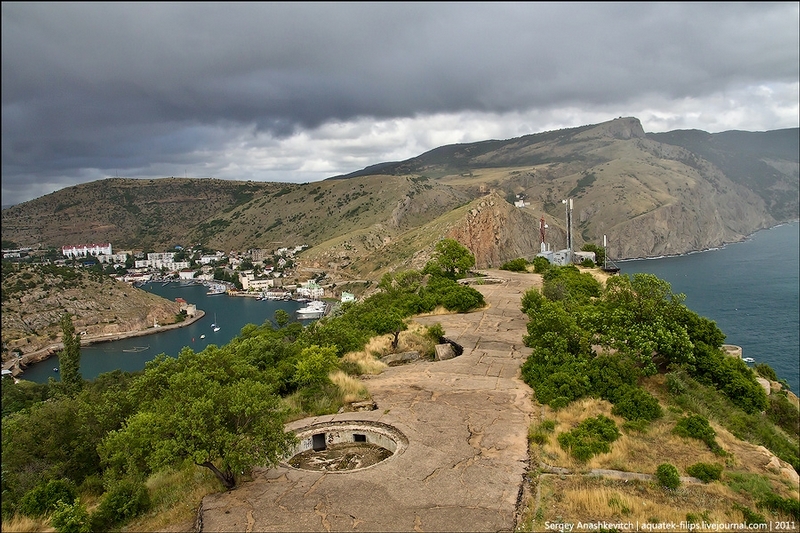 In autumn 1941, all four guns were turned toward the coast, and during 6 months continuously attacked parts of the Wehrmacht coming to Sevastopol . Germans were never able to capture this battery. 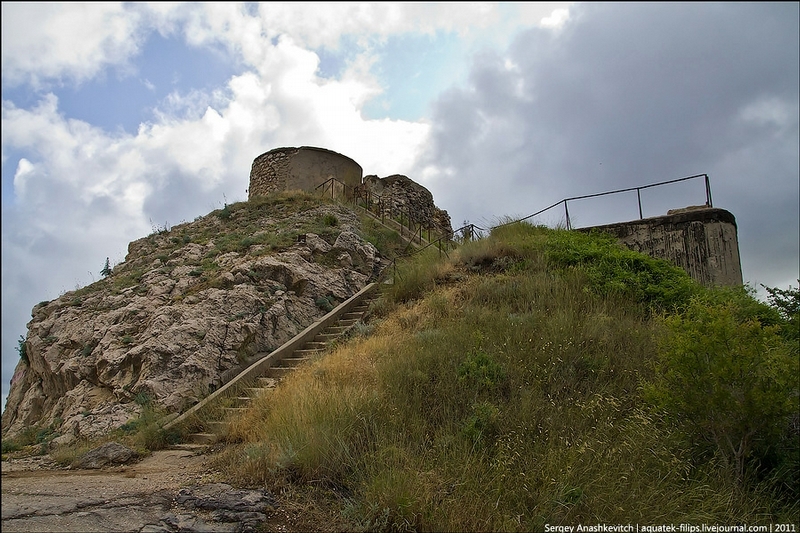 The Sevastopol defenders completely stopped their resistance on the 30th of June, 1942, when they retreated with the rest defenders of Sevastopol. The battery was destroyed only in 2002. 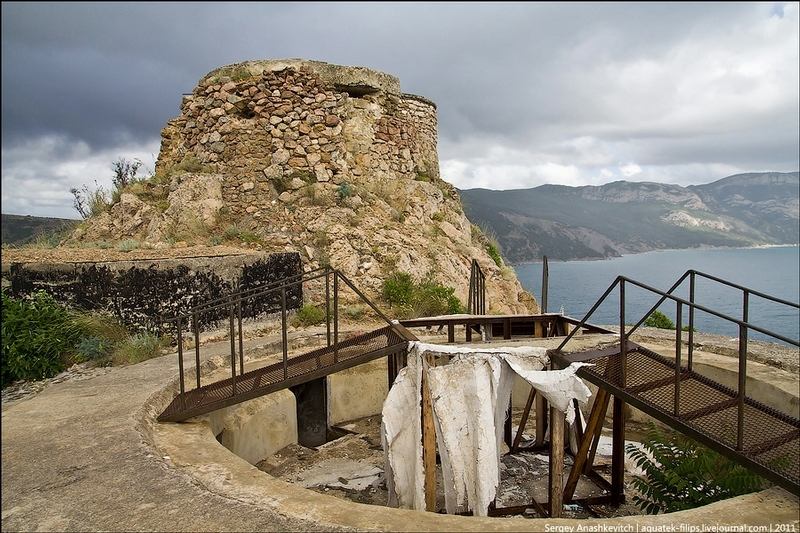 The battery construction was begun in 1913-1914, by order of the Military Council. 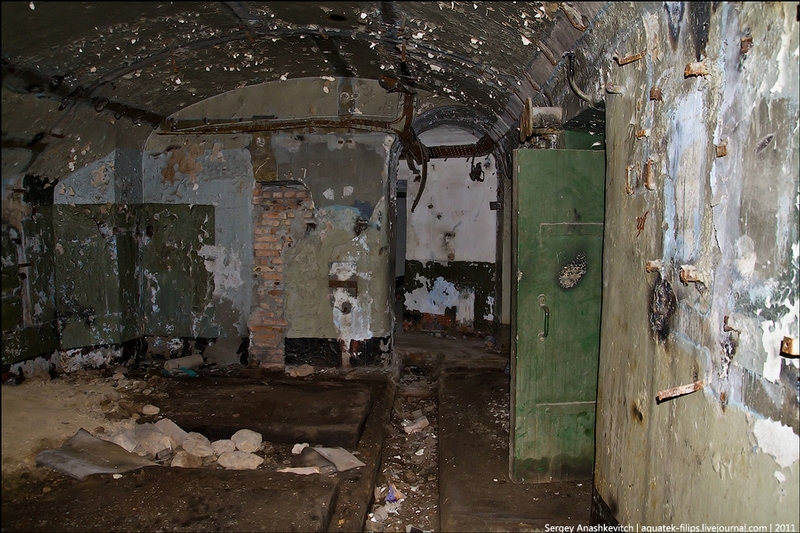 The supervisor of these works was colonel Petrov. 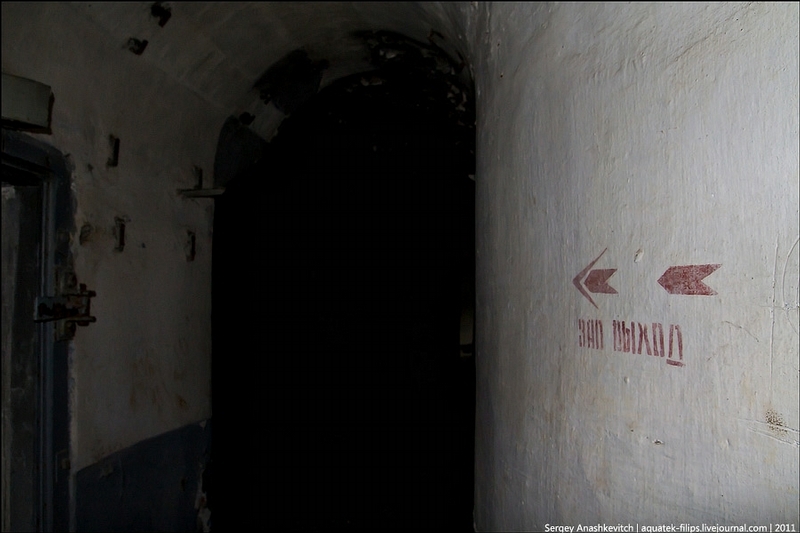 During Soviet times the battery was completed and armed with 152 mm guns, removed from decommissioned ships. The original battery number was different – it was called the battery number 10. 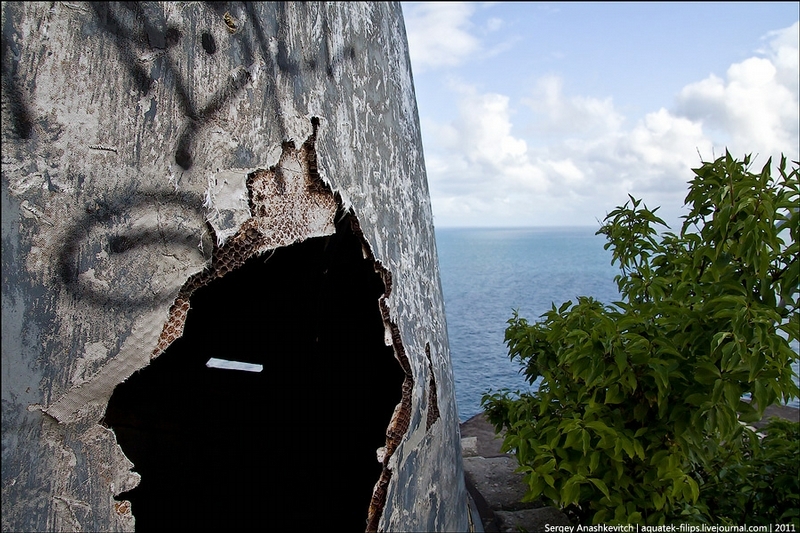 A view of the battery from the cliff Mytilino. 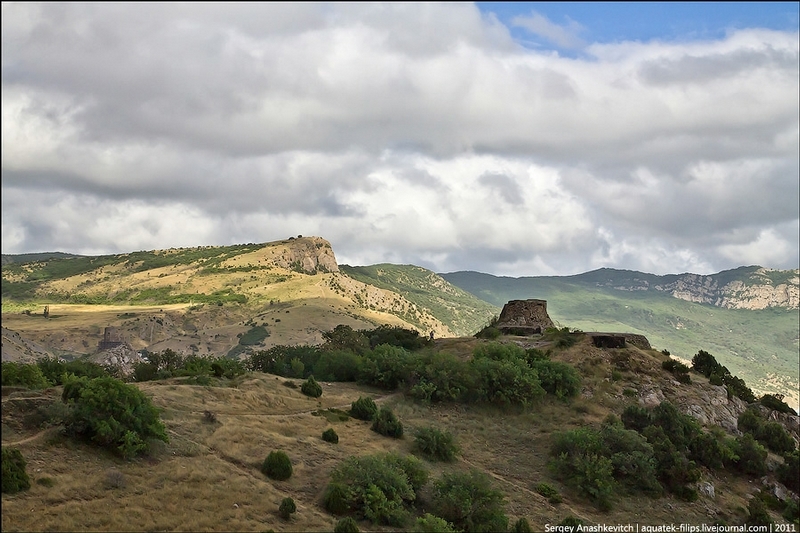 From here is could be easily seen how successful was the choice of its location – a perfect corner to fire. 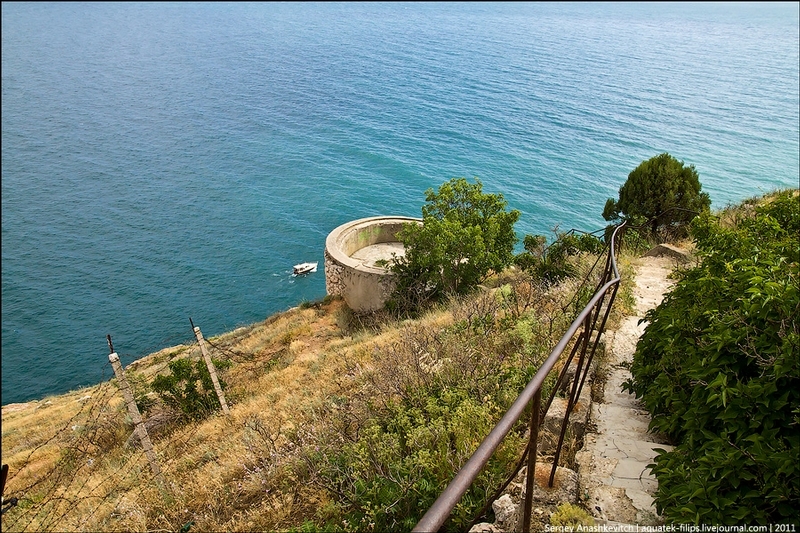 It is the location of the battery that predetermined its inaccessibility during the defense of Sevastopol. 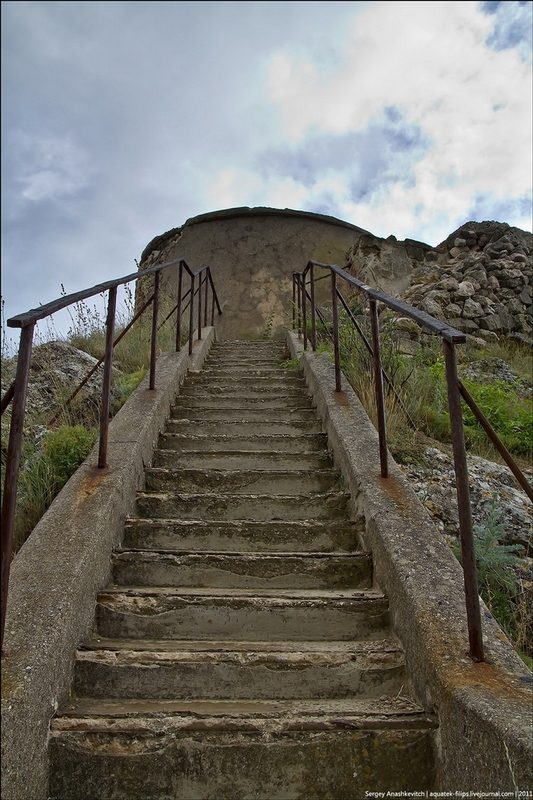 The battery, located on the hill to the right of the exit from the Balaklava bay, was installed on a concrete base and had magazines for ammunition and parapets protecting the personnel and weapons from enemy fire from the sea. 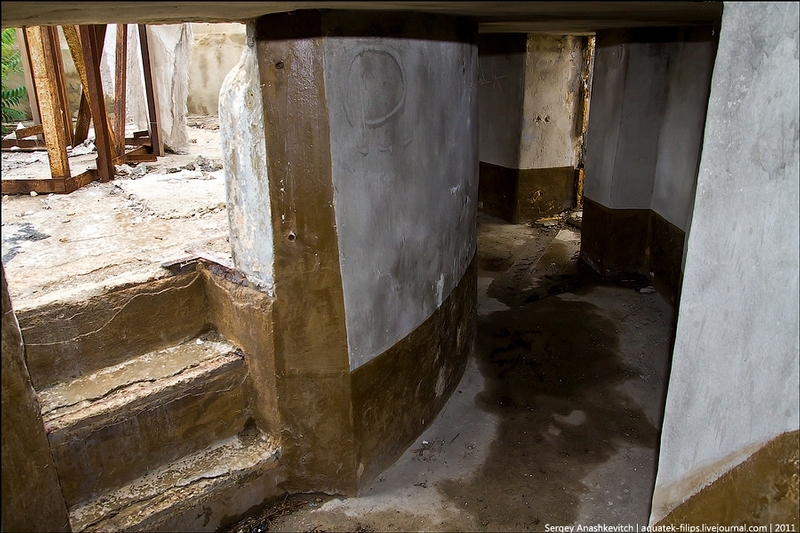 The parapet part is casemated rooms, which housed the personnel, support facilities, etc. Now here teens like to frisk and homeless people like to sleep. 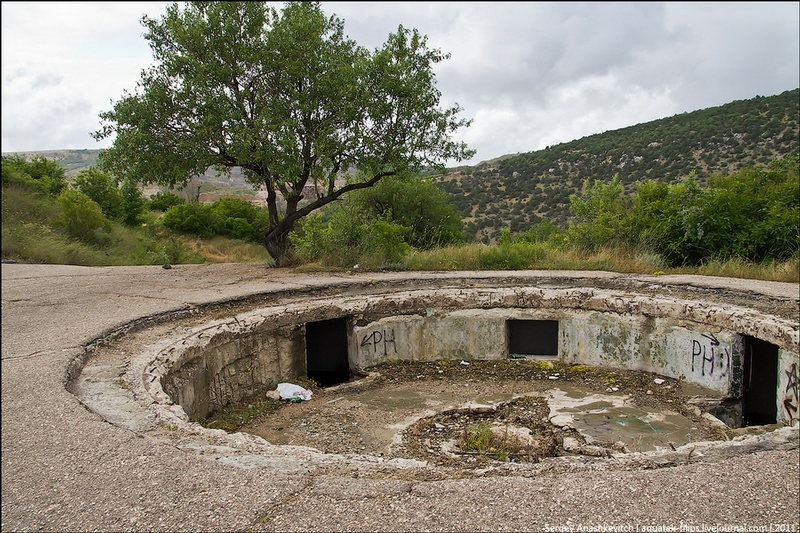 Before the war, the battery was renamed into the 19th and its first commander was Alexander, later he became the commander of the legendary 30th battery. Originally, the battery had the fire of 130 degrees and the rate of up to 10 shots per minute. 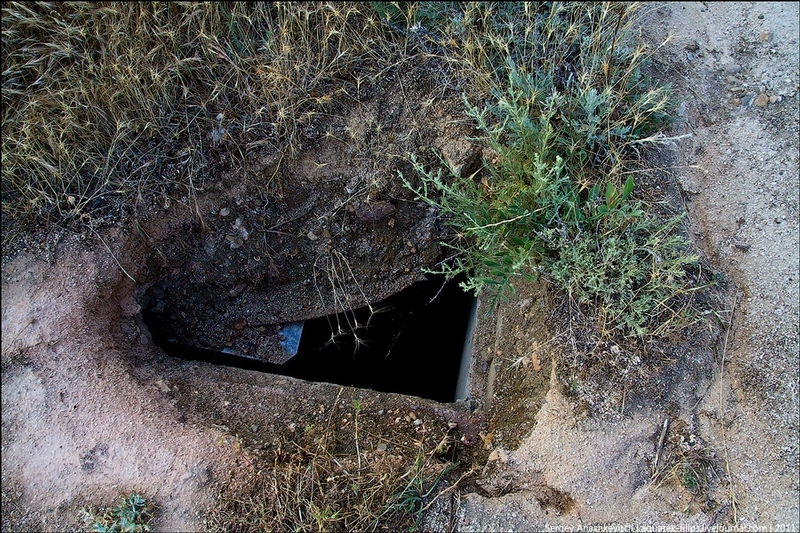 The base of one of later gun positions. 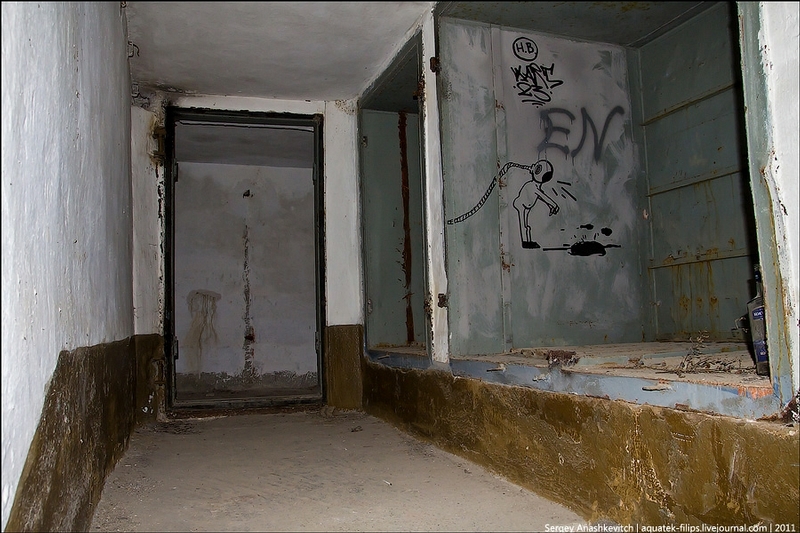 Modern gun positions have casemated service rooms at trier base. They were designed for guns serving, and for its charging, discharging during battles. 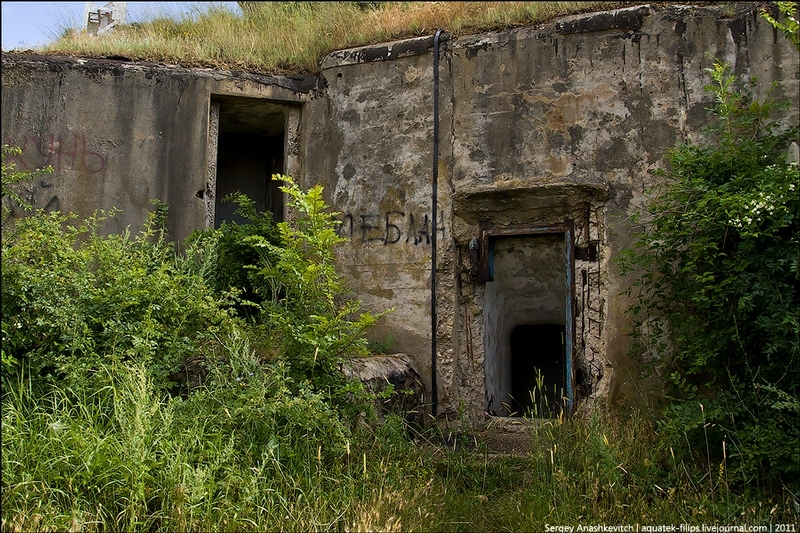 Ammunition casemates of the main positions. 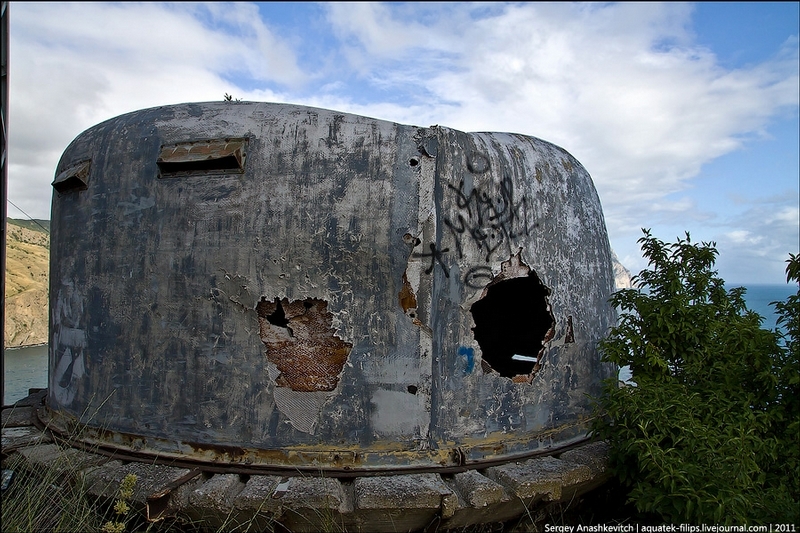 The battery was equipped with several observation posts and a rangefinder. 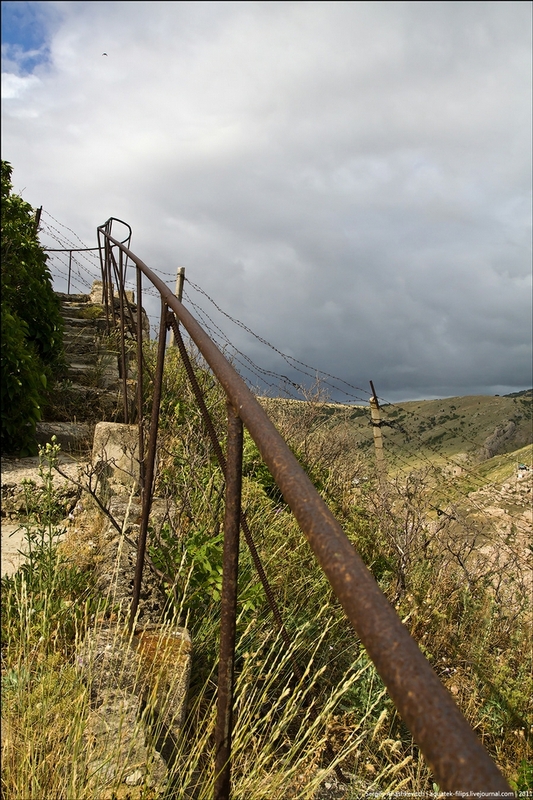 Railings and barbed wire turned out to be useless for raiders. 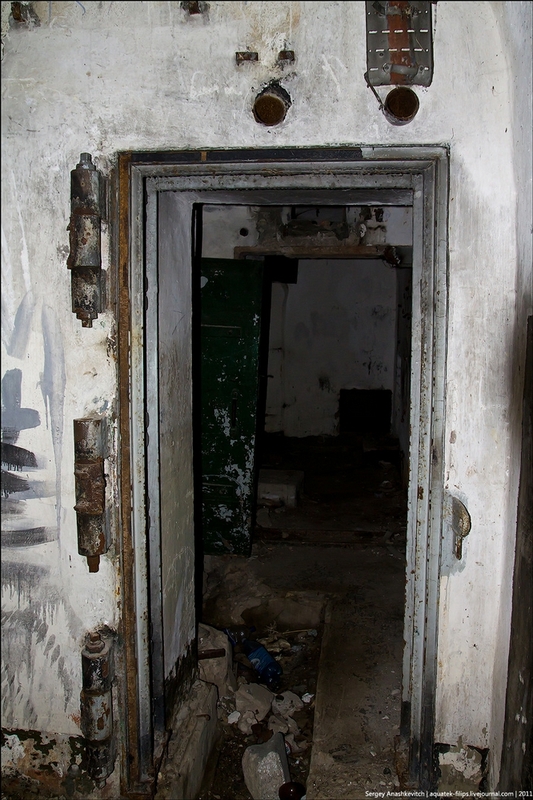 The entrance to the main battery casemates. 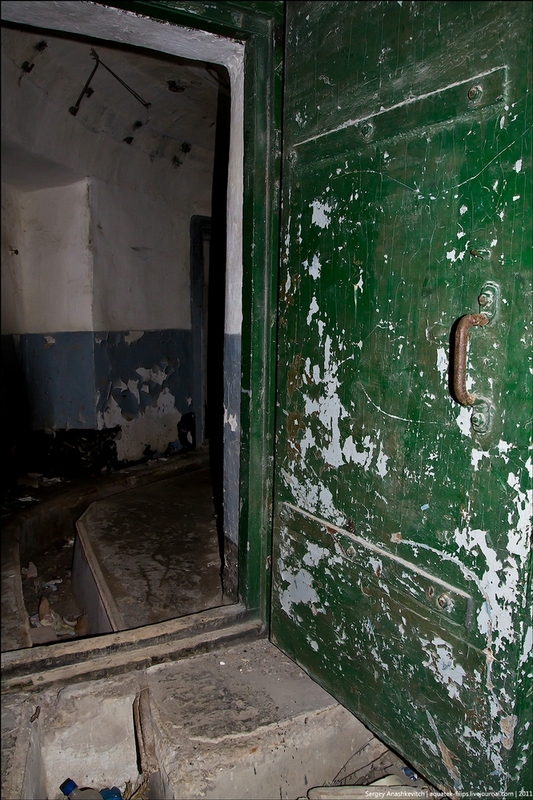 There are many facilities, and it is incredibly damp and cold inside. It is getting colder and colder. Here is a pitch darkness. 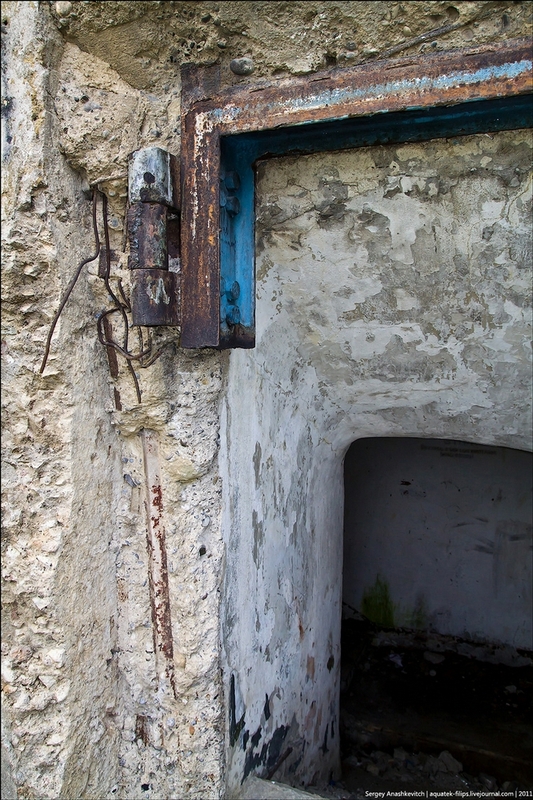 This little hole was the source of light in casemates. 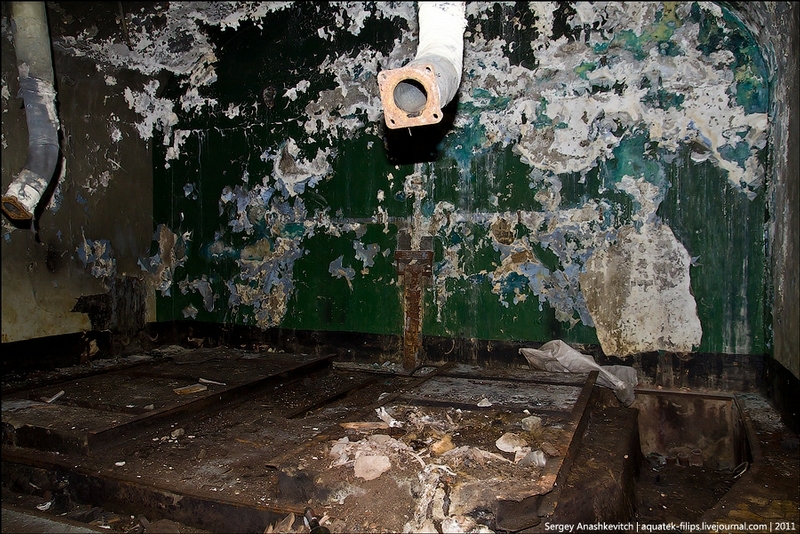 Its walls are made of material similar to fiberglass. Apparently it appeared here at the end of the battery life. 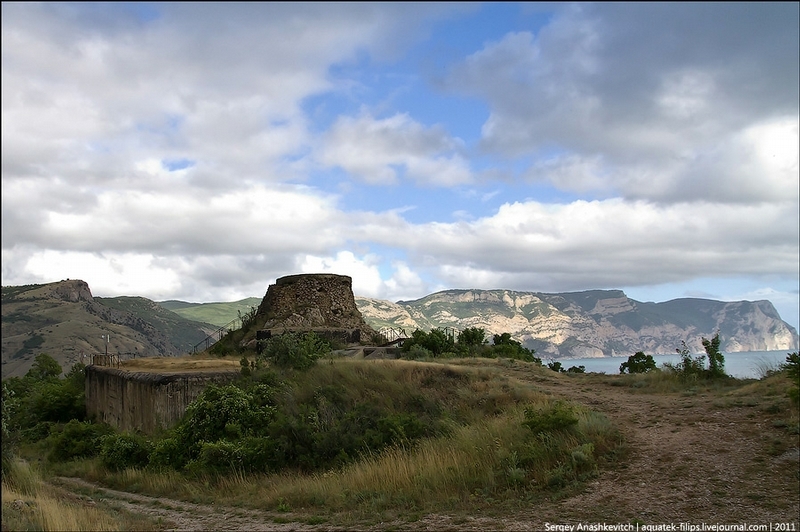 By the way, after the war the battery was rebuilt and served to protect the naval base of the Black Sea Fleet. And in 1999, it was prepared for the write-off. 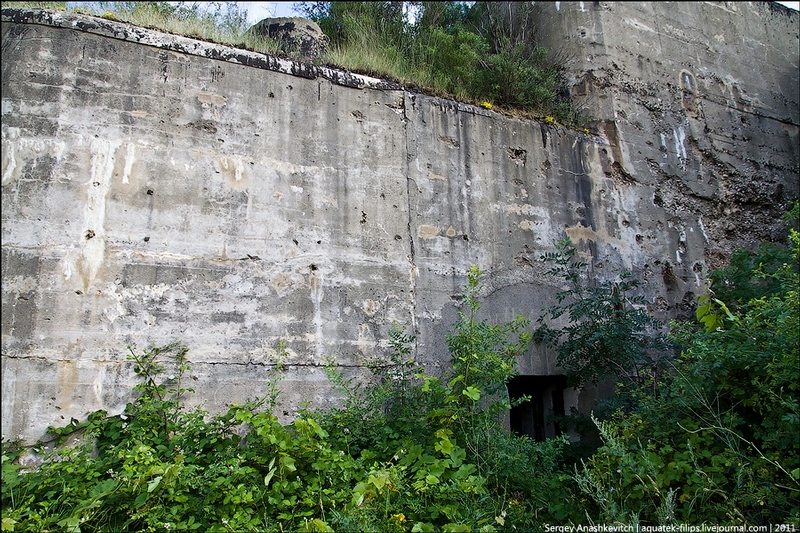 Remains of metal at the gun area. Amazing that a fixed shore battery should be in use until 1999. This may have been the last of such installation in the world! At that time these kind of “static defence” system totally failed against the might of luftwaffe aerial campaign. 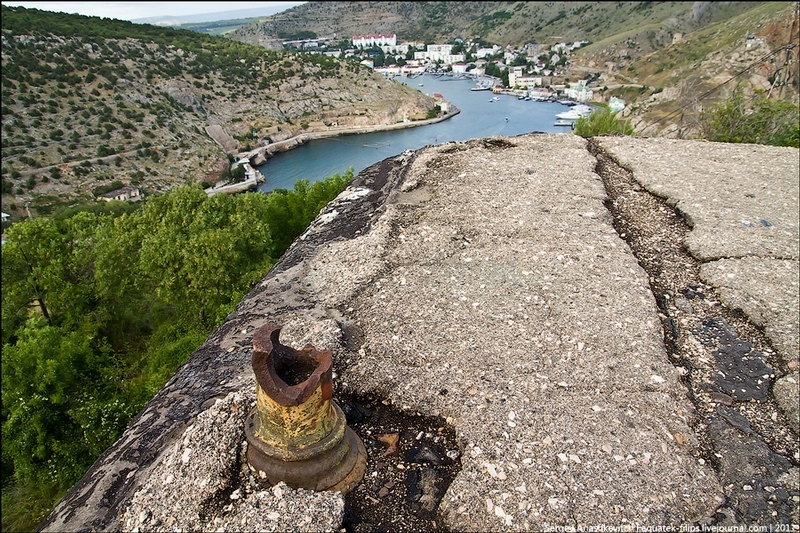 Is the battery above the well known submarine harbor (possibly in the mountain below, see last pic) ? It is indeed. It’s just a 10 minute hike away from the entrance to the museum entrance. 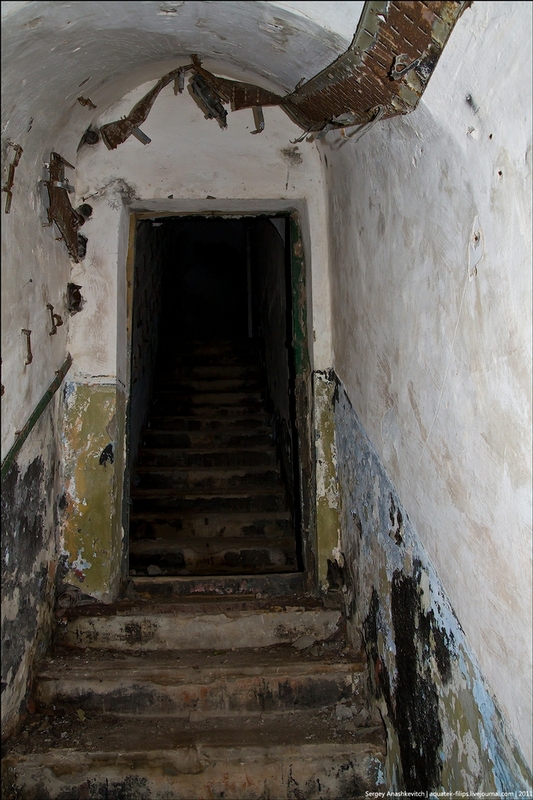 I bet this place has ghosts. It’s located in a beautiful place, look at that water. Speaking of water it’s raining.